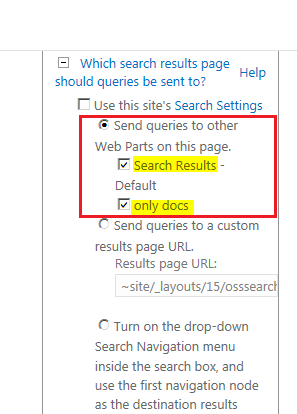 Question: If you have multiple result web part or combination of search result & content search web part on search result page. The result would be filtered on the basis of the search term and then would be the changes required to modify the search results. Answer to this Question: First need to identified the number of webparts that takes the input from search box on the basis of our requirement. Following are the steps that need to get the desired results. 1. Edit Search box web part under "Which Search results Page" Section. The list of search related web part displayed here as per the below image. Only two type of web part will be display here first "Search Result" and "Content Search Web Part". 2. Save the Settings to Click Ok & Save the Web part settings. 3. Change the web part query to get the desired results for each web parts.